Home » » Why I Celebrated My Father's Death On Facebook - NYSC Corps Member Finally Speaks Out. Why I Celebrated My Father's Death On Facebook - NYSC Corps Member Finally Speaks Out. 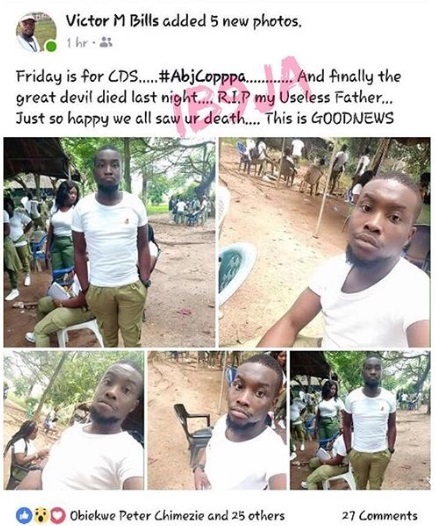 Over the past weekend, the story of a members of the NYSC serving in Abuja who mocked the death of own his father by celebrating the demise on social media, emerged online, and was trailed with criticisms and mixed reactions from many social media users. While speaking in a new interview with NewsmakerNG, the young man identified simply as Victor M Bills, who later deleted this post due to the appeals of his friends, opened up on why he thought the passing away of his dad was good news, and the reason about his obvious happiness at his father’s death. He disclosed that he was in no way sorry about the statements he wrote on Facebook, as his father’s demise was an answered prayer. According to him, his dad had denied him the essential fatherly love he needed ever since his mother got separated from him about 26 years ago due to an unknown reason. These were his exact words: “I can’t paint him white when I’m dying inside me. He always laughed and told me I would suffer and die before him. But the reverse is now the case… He wasn’t God. “He deprived me of fatherly love… And still didn’t wish me well. So his death was a great relief to the family… I’m not regretting anything. My friends asked me to delete the post. But I don’t regret posting it. “Now I wonder the kind of tribute the children will write for him and what people will know him for other than evil. I just pity him, because even at gunpoint I’ll never agree that he had an atom of love for me. “He cursed me every time he saw me. We never had a loving time as father and son. I’m not fabricating stories. I’m telling you the truth. Don’t know why he hated me so much. “Before now, anytime I met new friends I told them my dad was late so that they wouldn’t bring up topics about him. I always talked about my mum. So, when they saw my post about him, they were surprised I had a dad all the while. Even friends from secondary school. However, Victor who hails from Amaraku, Isiala Mbano in Imo State could not but celebrate his mother who took up the responsibility of taking care of him and his three siblings. He said: “I believe in the strength of thorough womanhood from my mum. I thought about how life would have been if my mother wasn’t hardworking and industrious. What if my mum had hooked up with another man after their separation. What would I have done?" As for whether he planned to grace the occasion of his father’s burial, the Abuja corps member said he would not only be more than happy to miss the funeral, he would also ensure his siblings and mother do not spare the time to do same. Towards the end of the chat, Victor said that, with the post he shared on Facebook, he hopes to awaken every parent who treated their children in ill manners due to the fact that they were hurting from the scars meted to them by their spouses.